If you cmd drag on a note you can change it’s velocity and also the default velocity. There’s a bit of a knack to this but it varies depending on if you are using a trackpad or whatever and how you have set up drags. Start by positioning the cursor over a note or selected bunch of notes, and then hit cmd. You should see a little line with two arrows. Now try a drag. This is the Mac... Using your NI controller as a remote MIDI controller within a 3rd party application that supports MIDI (e.g. using the MASCHINE MIDI template in Ableton Live). 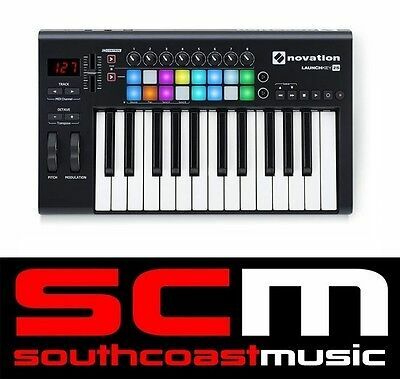 Using your NI controller as a MIDI controller within another NI application (e.g. using MASCHINE as MIDI controller in TRAKTOR or REAKTOR). Ableton’s velocity capabilities are actually quite customizable for that reason. Inside of Sampler under the MIDI tab, there is actually a velocity drop down menu where you can select tons of things to be mapped to the velocity. 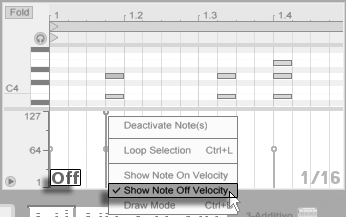 Selecting a velocity level sets the default velocity for the steps added to the sequencer. It is possible to hold a step in the sequencer and hitting a velocity level to change the velocity of the step.